"Media Action for Fairness," a civic group for promoting justice in media and preventing privatization of the media, held a press conference at COEX in Samsung-dong, Seoul on June 17, 2008, to demand resignation of Choi See-Joong from his position as Chairman of Korea Communications Commission (KCC). Media Action is composed of 48 media-related organizations and civic groups. The COEX was where Choi was giving a speech for the commencement of opening ceremony of the Organization for Economic Cooperation and Development (OECD). Media Action demanded that Choi should tender his resignation as KCC chairman rather than give his speech at OECD meeting. "Choi has to apologize for trying to control the press and resign from KCC chairman," a Media Action spokesperson said. According to a local internet OhMyNews, Mr.Choi Sang-Jae, chairman of National Union of Media Workers, said that Choi is trying to serve President Lee Myung-Bak by attempting to control media and press. 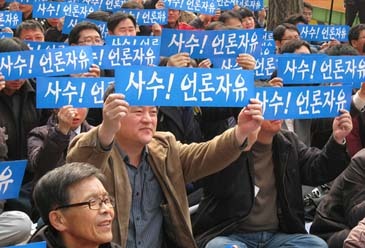 Members of National Union of Media Workers denounce President Lee Myung-Bak's appointment Choi See-Joong as chairman of Korea Communications Commission (KCC) in a protest in Seoul on March 26, 2008. 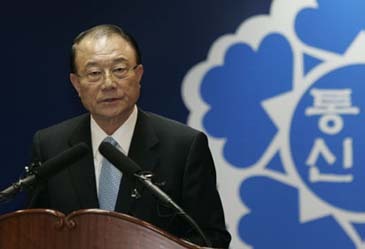 Choi's resignation issue has been brought up due to his explicit disposition in politics with President Lee Myung-Bak. "Choi has been trying to control free and independent media as President Lee's protégé since he was appointed by President Lee to KCC chairman," the spokesperson said. President Lee's so-called "press friendly policy" turned out to be a policy to control free and independent media, Media Action said. Park Seung-Heup, spokesman for the opposition Democratic Labor Party, said "I have no idea since when KCC has become the ruling party's maid when it is supposed to secure such values as neutrality and autonomy from the political influence," wrote Media Today, local weekly dealing news on media and media people. Park also blamed Choi for joining breakfast meeting held at Presidential House of Cheongwadae on June 9, 2008 where President Lee Myung-Bak was holding a political meeting with his inner circle members including his older brother Lee Sang-Deuk over anti-US beef issue. Choi's recent involvements with politics yielded criticisms with his position as KCC chairman. Critics say Choi has actually violated the KCC regulations which ban KCC members from being involved in politics or any political activities. Media Action also warned President Lee not to make political appointments for positions of local TV stations, KBS, YTN, and English-language Arirang TV. In particular, Choi has been trying to force Jung Yun-Joo out of the position of KBS president, who has been critical of the ruling Grand National Party and President Lee Myung-Bak. Jung, appointed by the former President Roh Moo-Hyun, still has terms to serve. Media Action through interview with OhMyNews said that Jung should be guaranteed to serve his remaining term, and KBS should remain free from any political influence. According to another daily Kyunghyang Shinmun (www.kahn.com), President Lee's government attempts to gain control over hugely influential KBS for its liberal coverage in cases of the recent mass anti-US beef and anti-government candle-light mass rallies. KBS is a major network TV which is the most influential medium in the nation. On behalf of President Lee, Choi has disregarded such objections and criticisms, and went ahead with making political appointments for positions of a couple of broadcasting corporations assisted by the government. In one case, a pro-Lee Myung-Bak journalist Ku Bon-Hong was recently appointed by Choi as the president of YTN, 24-hour news channel, in spite of strong oppositions from the civic media watch groups. Ku was helping Lee during the last presidential election as a special assistant for media. Many YTN journalists also expressed objections to Ku's appointment. In another case, another pro-Lee Myung-Bak figure Chung Kuk-Lok was appointed to the president of Arirang TV. Chung, who was serving as CEO of Jinju MBC, quit his job to help Lee as a media assistant during the election. A third pro-Lee Myung-Bak person, Yang Huee-Bu, who also helped Lee during the election, was appointed to president of Korea Broadcast Advertising Corporation (KOBACO), which decides TV advertisements for broadcasters. Meanwhile, media professors said that it was rare that the government is trying to control media this way, when the nation has been in democracy for some 20 years.